Sorry to hear about your loss but glad your still thinking onward and upward! A sounds very complicated to me! Thanks LMS – it’s only a small loss, so no real concern. Hoping it’ll do better this year! That’s an interesting strategy you have there. I haven’t done any picking of individual stocks but I have been looking at National Grid. It’s appears to be at a good price and a number of the ratios (dividend payout, current ratio, price/earnings) look good too and considering it basically has a monopoly in England & Wales I’m failing to see where it could go wrong. I don’t want to be too optimistic with any of them in case one of them (or more) turns out to be a Capita or even worse, a Carillion! Ive been looking at NG as well – its PE, dividend and defensive qualities are highly attractive. However, its debt has put me off, especially with rising interest rates that cannot be good. I know John Kingham (UK Value investor) has written about NG’s debt and why it may not matter as much as with other companies. Still not convinced though. I’m kind of relieved that JK has said that about NG’s debt but even he can’t be 100%. Fingers crossed then! When I lose a bit of money like this, I found it helped to reframe as having paid for learning/training. If I can figure out lessons learned, and apply them – then even a hefty loss can be reframed as money well spent. Good luck with 2018’s pooches. Cheers Chris – let’s hope there won’t be any hefty losses! You got balls for sure! Good luck and lets see what happens next year! Last few weeks have not been pretty but in it for the long term so not panicking!! Haha, thanks Mrs Chai! The markets appear to have kind of bounced back already so no panicking on my part! I see 2018 is Chinese ‘Year of the Dog’ so maybe you will have better luck this year! Ha, I didn’t even link the two together, DIY – thanks and here’s hoping for a prosperous Dog year for all! I do run my numbers every week (desperation?!) so I saw the drop hit – not nice to see but I know that this means either I will buy more for the same money, or it will go back up! Interesting to see this years stocks…I only hold 2 of them (AZN and SSE) – I wait with interest to see how this pans out! When I started investing, I was checking my numbers pretty much every day, haha – not great for the stress on my heart! These days, I check just once or twice a month, just before I do my month end update. But you have the right attitude, when the prices are low, you’re buying more with the same money! Yes, interesting that it wasn’t just Capita which underperformed but who could have predicted which ones would go up or down? I hope to be running these portfolios so I have at least 3 years’ worth, perhaps 5 years, depending on my nerves haha! Or I may just continue to keep this as a fun part of my portfolio. Good luck with your stocks, FiL! Dear Weenie, beating the ftse 100 total return by more than 20% is success. Well done! Hi Sean, yes, I should be more positive – it was a success in that respect! £1000 is a minimum investment, and if you are investing in shares your time horizon needs to be 5 years or more. If you are buying £250 worth of shares with a typical commission of £12.50 (which is what I pay) then your investment needs to grow by 5.5% just to cover trading costs and stamp duty. Optimistic in one year. Forcing yourself to sell after just one year increases the chance of locking in ‘paper’ losses. It is all about time in the market, not timing the market. As Warren Buffet said, ‘our preferred holding period is forever’. My personal strategy is long term buy and hold of high yield blue chips. All dividends reinvested. I almost never sell a share and I am in the fortunate position of being able to implement a £2000 minimum purchase. It takes a little discipline but this naïve approach has beaten the market every year since I adopted it. 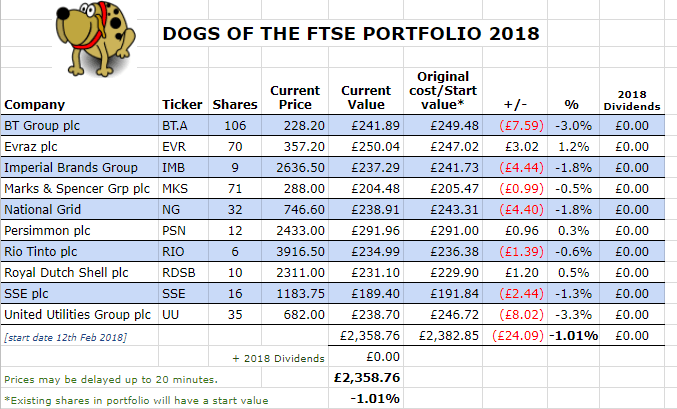 My main investment strategy is buy and hold, with dividends reinvested – this is just a small experimental part of my portfolio, following the Dogs of the FTSE strategy. Agree that selling after one year can lock in paper losses but I’m just blindly following the strategy as something different to what I’m doing with the rest of my portfolio. Oh wow! Bad timing indeed! Maybe the capita crash was caused by everyone selling out of their yearly dogs portfolios and you were just a bit late 🙂 ?! That sounded silly at first but there could actually be something in it…? Maybe it would be better to run the experiment from now until to December to get ahead of any potential selling crowd this year? Glad you are rounding up the dogs for another year… Finding it very interesting so far. Hear what you’re saying but what if there’s a crowd selling in December or January this time round? I think I was just unlucky so perhaps I will be luckier this year! There’s so much randomness and luck I think that can change everything. Hears hoping your new dogs perform better than the old! 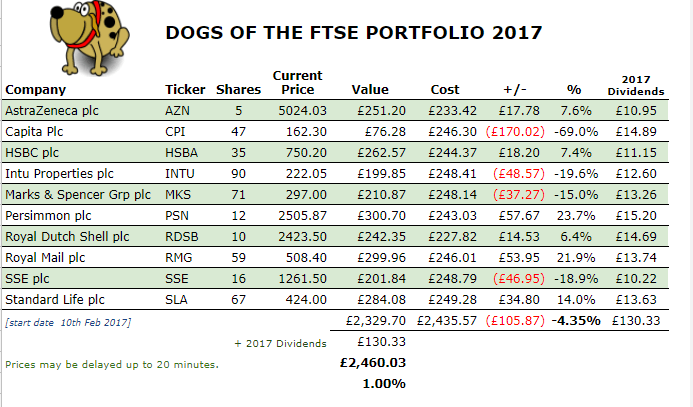 That the money used to invest in this portfolio was cash I wasn’t expecting makes it somewhat easier to risk it with this experiment – I’m not sure I would use my hard earned salary on something like this! The new dogs are looking good so far but I don’t want to be too optimistic! I like experiments like this – kudos for putting your money where your mouth is. Have you considered a stop loss of say 25% to limit your downside? In a bear market, when correlations go to 1, you have a pre-planned exit to avoid a much deeper loss. Thanks Craig – I had originally considered just doing it as a virtual experiment but knew that if there wasn’t real money involved, I’d quickly lose interest in updating it! I haven’t considered a stop loss although have been tempted to sell when there was a large profit. However, I’m committed to the strategy which is to hold the stocks for a year, so have to swallow the losses (if any).